On their fourth wedding anniversary this couple came to me this week for permanent wedding bands > on their arms. Because tattooed rings on fingers blur unpredictably, I often suggest a band somewhere else to fulfill the symbolism. I particularly like that these two have the same pattern, obviously they are a set, but the size is proportional to their individual bodies and the coloring is done using the same colors but his is just a bit bolder. Seen together they make a pair, but apart they are complete, as one hopes their romance and marriage is lived. 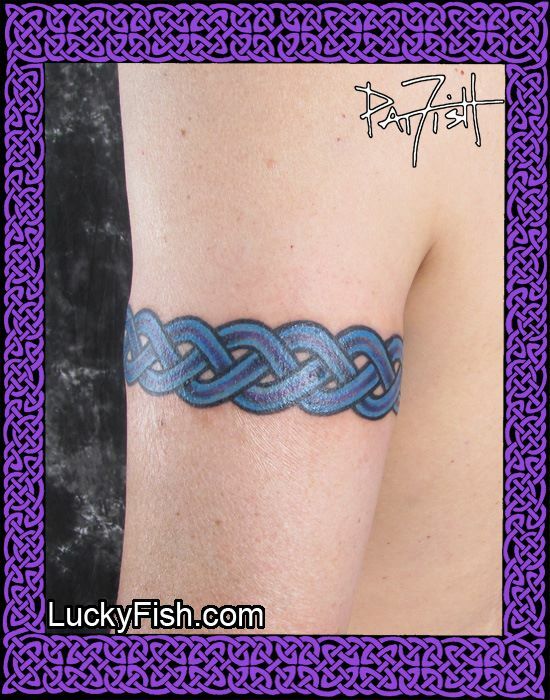 To see more matched tattoos, visit the Sets and Pairs tattoo portfolio page.